The coastal landscape of Australia is mostly timber and it is used extensively in both domestic and commercial architecture to good effect. The extensive rôle timber and timber architecture plays in the Australian landscape has influenced the works of earlier Australian artists like Nicolas Chevalier and Hans Heysen. 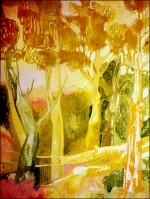 It has imposed the particular linear style that is noticeable in Matthew’s Australian landscapes. In the countryside beyond Melbourne, timber architecture is to be seen in abundance. It is used for farms and outbuildings, dividing paddocks with weather-worn posts and railings and dotted over the landscape in the form of curiously shaped dead trees and grey tree stumps. Also unusual are the buildings roofed in corrugated iron. In Australia it is used with great imagination and elaborate architectural permutations in the roofing of rural houses. Deep greens combine with light acid tones and yellows used in the Australian paintings show the use of scumbling, glazing and overpainting. These works of art owe their deep tones and soft matt appearance to the absorbent and dark brown canvas priming the artist adopted while working in Australia. What principally attracts the viewer is the abundance and variety of the many kinds of Eucalyptus trees and mangrove swamps. The venomous local wildlife, bush flies, poisonous snakes and vicious soldier ants made creating these paintings out of doors especially in the jungles of north west Queensland both difficult and hazardous. Fern Tree gully waterfall was completed in Ballarat, Australia. It formed part of a Sydney exhibition at the Bloomfield gallery. It originated as a felt pen drawing dated executed in Raglan in the state of Victoria. The drawing shows the falling waters, and Moss' serendipity in capturing their mass and the ever changing patterns and shapes which they assume. In watercolours done previously in Agadir in Morocco the artist had depicted the movement of the waves in a more severely abstract form reducing them to coloured patterns; here the waterfall is treated in a more calligraphic manner. In the drawing's transition to canvas a Belgian linen was primed in a white chalk darkened by the addition of acrylic burnt umber. The unevenly woven support was allowed to retain its roughness by the application of the colours as washes which tend to sink into the surface. 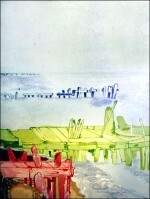 Part of the painting's undercoat was laid over with an application of fight blue wash, reinforced in the background sky, giving a somewhat mauve appearance to the lower right underpainting. A number of alterations which the work underwent during the course of construction, including a timber shed in the lower right-hand section, can be seen under radiographic examination. The painting forms part of a series with the another oeuvre the "Wannon falls" *also of a relatively large format painted on a dark priming. 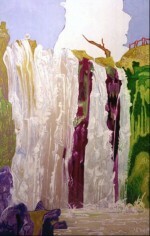 The large Wannon falls was executed to a greater extent in oils to exploit the features inherent in glazes and transparent colours. However, both the paintings began as naturalistic sketches which Moss then modified. 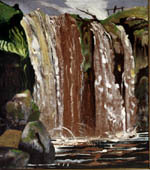 In the Ferntree gully waterfall this is most clearly seen in the use of primary colours; the dramatic cadmium reds, touches of cobalt to silhouette the waterfall, and mauves and primary greens, take the work one remove from naturalism. The orange segment in the upper part of the canvas acts as a background foil to the four white brushstrokes indicating the emergence of a stream of water. The lightly sketched-in dead tree trunk on the left is echoed in the luxuriant mass of green cabbage ferns which emerge from a gap in the rockface, offering relief to the eye from the intense reds and blues which dominate the canvas. 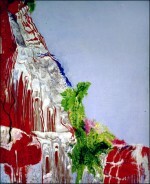 The white calligraphic brushstrokes of the failing waters in the centre of the rock formation continue as rivulets and streams breaking over the scarlet rocks to the left and dribbling and escaping as vapours in the pools in the lower right giving rise to what in Ireland would be known as a busy canvas. The Australian Alps in winter display an overall greyness because of the massive rocks, heavy mists and snow in marked contrast to the colours chosen by the artist Matthew Moss' Mount Buffalo waterfall. The canvas is executed in variations of green ranging from light cadmium greens mixed with titanium white to zinc yellow and fight cadmium yellow through to deeper tones of the same colours in the middle passages. The massive boulders from which the waterfall cascades are painted in a fight, rococo manner with the only other colour in the canvas, the grey-blue sky, providing the foil. 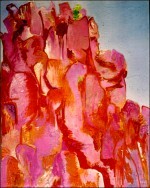 The solitary rock on the right is executed with some impasto provided by the addition of alumina hydrate zeolite pigment. The artist used acrylic colours for the flat tones in the very light area at the top of the canvas. In addition, Matthew used oil based pigments for the modelling of the contours of the rocks and waterfall. The painting's support is a fine grained Belgian linen primed with a white gesso. Over this and extending to the lower levels of the footbridge an undercoat of fight blue in acrylic has been added, giving a cool appearance to this part of the canvas. In the lower section an undercoat of a dark lead tone in acrylic has been added. Here, deeper tones of oxide of chromium and olive green emphasise the darkness of the priming, creating a dark cavern spanned by the footbridge. The two bridge supports display a climbing vine while the seething waters of the river are executed in variations of olive green and white, in a graphic linear manner. The painting was begun in August 1980 and based on a series of pencil sketches, although the main composition was from a drawing of a footbridge crossing a rock strewn torrent which was fairly complete in itself. It was as a consequence only necessary to incorporate a second drawing, a massive precipice, to complete the composition. By selecting a non-­naturalistic range of colours, the artist distanced himself from any tendency to naturalism. Although the subject is recognisable as a bridge over a waterfall, it can be seen in the manner in which he has sketched the bridge, the delineation of the rocks and the formal arrangement of the water's movement, that the artist has chosen the subject matter as an exercise in calligraphy. He has extended the range of tones from a limited selection of colours and established the form of the details in the most economical manner. Two years after the painting was completed it was reworked but to a minor degree. 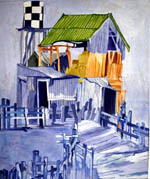 The painting is an accurate description of a watertower in an area of the Victoria state in Australia. Most of these cattle farms relied in the past on rain water storage in galvanized iron cisterns during frequent periods of drought. It would be, often, the only source of potable water The graphite drawing on which Matthew Moss based the painting shows that the haybarn on the right had, by then, assumed the architectural inclinations of the tower of Pisa. One can see that the entire structure, including the two lean-to sheds, is rigorously composed of corrugated iron, an ante-litteram Frank Gehry. The beauty of these farm buildings was the skill with which the builders integrated hardwood timber elements into the overall iron structure. In 'The checkerboard watertower on a Gippsland Farm' Matthew has brought into relief the timber elements by using red and yellow ochre pigments in place of the cobalt blue of the landscape's dominating colour. 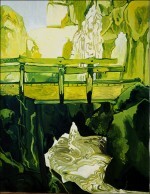 The green oxide colour used to add contrast is the only other colour that features in the canvas. The remaining elements, the sky, timber footpath and railing and gate use the cobalt blue to create an effect of 'false colour' - mostly encountered in infrared colour photography - to strip out any too naturalistic artistic elements. Brighton beach named, no doubt, after its namesake in England, is a bayside suburb in Melbourne with an extensive harbour for those Australians who love to sail. The older sections have portions of superb architectural interest with boardwalks of bolted timbers similar to those visible in Matthew's South Melbourne beach canvas but in a better state of repair. Matthew Moss began the subject with a drawing of some detail where most of the elements reappear in the final canvas. The major difference is in the background where some of the clouds, sketched in his previous Red Sea journey by packet boat are reintroduced in place of the hills in the original drawing. 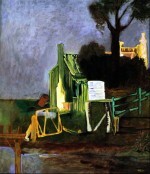 The walkway appearing to the right peters out uncertainly in the sketch, but in the final work assumes a more important position in the composition by acting as a cut‑off line between the clouds and the busy foreground. The blues and touches of green in the rear of the canvas are executed in acrylic; the foreground is a much more complex combination of both acrylic and oil. The timberwork of the boardwalk and posts projecting from the sea have been successively reworked in oil and acrylic combinations, resulting in a delicate mixture of tones. The flat shapes of the foreground boats were deliberately sought after by the artist and were obtained by executing the structures in flat oils and overpainting in simple flat combinations of acrylic. The boats appearing lightly behind the pier are in the original sketch but are now fleshed out by incorporating some of the forms from the Djibouti felucca drawings. The painting has a very light delicate appearance, the result of the white priming and the soft absorbent pastel look of the surface. The squat heavy appearance of the boats is reminiscent of the work of Pieter Brueghel the Elder. ' Boats at Brighton Marina in Old Melbourne' was exhibited in Melbourne at the Bartoni gallery following a previous exhibition in Sydney. Hambro bank (private banking division of Société Générale group ) leased the work of art subsequently for a number of years. This canvas is the most complex of the artist's early Australian series and uses a wider range of techniques than that of other works completed in the same period. The canvas was primed with a soft burnt umber tinted gesso on which the design was outlined in white. Some fragments of this are still visible in the silhouette of the upper right hand side trees. The painting originated with a pen and ink drawing showing the trees to be located to the left, a wide flowing river in the background, and a grass covered mound appearing at the point where the river widens. On the nearer bank is a rock-strewn area and a small pool from which reeds are growing The original drawing also shows three figures, with shovels and pickaxes, engaged m opal digging. In the subsequent painting the figures have disappeared and the relatively simple pen drawing is transformed into a canvas of some complexity. The grassy mounds in the centre of the river have now moved centre left of the canvas. Its shape, the rocks protecting above the water and the movement of the river itself are all indicated by a warm mid-green colour The colour continues into the lines of ripples becoming tones of cadmium yellow and mixtures of yellow ochre. Apart from the lower right quarter of the canvas the rest of the work, including the river and its movements and the various features dominate the canvas in a mixture of greens which run the gamut from very light tones to greens with am orange undertow. The flat green bank on the lower right, dotted with rocks and inlets, extends leftwards assuming shapes which evoke the forms of the artist’s earlier surrealism. In place of the three figures fossicking* stands a eucalyptus tree. This is painted in tints of of deep cobalt, ceruleum blue and white. 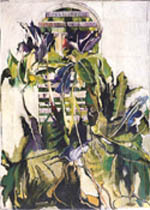 The darkest tone of the work is the tree's foliage, executed in a deep viridian. The foliage seems to unwind and continue into the dark centre of the and mass. It is repeated in the rocks and the grassy banks in the reminder of the canvas. *An Australian term, originating in the Cornish gaelic language, meaning prospecting for gold or precious stones. An early twentieth-century Australian homestead overwhelmed by the encroaching forests of the Victorian Alps. The West Gate Bridge is a fine example of Australian urban architecture. The painting is the earliest surviving canvas from the artist's stay in Australia. The massive engineering construction was visible from his house in South Melbourne and at the time that the painting was executed was still a year away from completion. 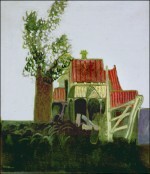 The painting shows the bridge that Matthew Moss saw from his studio window in south Melbourne during the final stages before the final span was put in place. The construction is an object of very pleasing aesthetic nature with the sea and the landscape emphasizing its grace and form. The sinuous shape of its 2,500 meters constructed in box girder and cables in turn emphasises the beauty of Melbourne's coastal landscape. 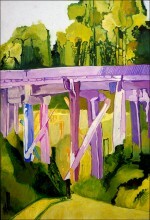 A few years previously 15 October 1970 the missing span shown in the painting had collapsed during construction falling into the Yarra river below. Thirty five workers lost their lives including a high proportion of Irish navvies employed in its construction. The centre of the canvas shows some houses sketched in in red, with the Westgate bridge dominating the upper portions of the canvas. The town hall, in light ochre, reds and greens, with its impressive clock tower, does the same for the lower part. The buildings of Port Melbourne, then a working class district on the seafront appear below the pylons of the bridge. Their tin roofs, elaborate chimneys and cast‑iron work façades are characteristic of late Victorian architecture in Australia. The turreted building and silhouettes, seen in front of the bridge, is the town hall of Port Melbourne. During Matthew Moss' residence the area was reminiscent of New Orleans to where a lot of the ironwork of the façades was exported in the late nineteen sixties. The painting is executed on a roughly woven canvas with a dark umber priming over which, a deep prussian blue has been scumbled. The outline of the bridge's structure was drawn in yellow ochre and a very flat ultramarine blue with the addition of white was used to give form to the structure and at the same time achieve a soft pastel effect. 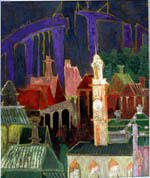 While the background tone and the bridge itself are executed in acrylic, the red roofs of the buildings to the left are scumbled in oil. A number of the roofs in the foreground are in various tones of green which is repeated in the stylised green foliage below the incomplete bridge. The power pole in the lower left appears in the same point of the pen drawing of the subject done some weeks after the artist's arrival. Images of pylons in this canvas , created from rough hewn tree trunks are derived from drawings the artist made later in Heyfield, Victoria state. This comparatively large painting was preceded by a fairly complete drawing done at Hayfield in the Gippsland area of the state of Victoria, Australia. It is a small town nestling in the foothills of mountainous country; the logging and the timber milling region for the state. The area, which is lushly vegetated, was settled early on in the history of Australia and claimed a number of goldmining towns in the vicinity of which Walhalla is possibly the most noted. Being a timber region extensive bridgeworks were constructed for the railway line of 1878 in timber and remain in use today. In the drawing, and the painting which followed it the artist indicates the massiveness of the construction with straight vertical and horizontal fines. These, boldly laid on in contrast to the fight and delicate treatment of the same elements in the, Abandoned Yellow Timber Hay Barn in Gippsland° are inpainted with solid flat areas of mauve, madder, cobalt and ceruleum blue. The road in the foreground and the hill through which it passes are treated in a similar fashion in a gamut of greens which foreshadow in their range the subsequent 'Mount Buffalo waterfall' . In the upper reaches of the painting the luxuriant foliage of the trees are laid in, in firm brushstrokes offering a vertical contrast to the horizontal railbed cutting across the width of the canvas. This painting as are most of his Australian period works is of Belgian linen primed with a semi absorbent chalk medium. Over this is applied an undercoat of raw umber upon which the work was begun laid out with a round brush and dark pigment. The oil sketch was executed and the canvas commenced in tones of yellow ochre. It had not progressed to any noticeable extent when it was laid aside as the artist prepared to return to Europe. Upon his return to Australia he worked on it again. It underwent changes with more drawing added to the work on the railway bridge. The dimensions of the bridge struts were altered, some new ones added and others eliminated. The colour scheme underwent a complete change, the softer scheme of the earlier stage being now supersceded by a range of contrasting strong colours. The elaborate design of the lower half was sharply simplified and a more calligraphic use made of the paintbrush to indicate the pathway in the lower left and shadows under the pylons. The treatment of the trees in the upper section are now somewhat reminiscent of the work of the Vienna sezession painters particularly Gustav Klimt. Matthew Moss was asked by the Australian government to advise it on setting up a conservation laboratory for the restoration of Australian Old Master paintings in the historic township of Ballaret in the state of Victoria near to Melbourne. He sailed for Australia from Genoa on the Italian liner the Galileo Galilei. 'Boats at Djibouti' was painted by the artist while travelling eastwards through the recently re‑opened Suez canal. The long flat dhows had been used from medieval times to transport cargo along the Red Sea coast. On the artist's journey the packet boat made a stop at the then French colony, Djibouti, resulting in two signed drawings of local boats. One of the pencil drawings is a series of four studies of feluccas that appear in a painting completed as the journey continued through the Indian ocean. Above the upper horizon to the left of the painting appear clouds taken from drawings done from the wake of the ship as it proceeded through the Red Sea. The fine grain Irish linen canvas had been prepared prior to the journey in Italy with a light ochre tone which appears through the azure sea background. The boats are similarly delicately executed, the technique ensuring that the two at the top merge gradually with the background tints and shapes. The first drawing is also the source of the background boat appearing in the lower half of the canvas. It is of an intense cadmium yellow and the form is defined with flat white panels. The effect creates a two dimensional shape which does not unduly arrest the eve but instead leads it towards the foreground boat. The eye is further nudged in the same direction by the shape and direction of the ripples in the sea moving upwards from the base of the canvas. These are delicate traceries of white, fight cobalt and azure with some touches of emphasis created by the line of blue beneath the boat, the small shape of the rowing boat and the deep blue green shadows beneath the background one. 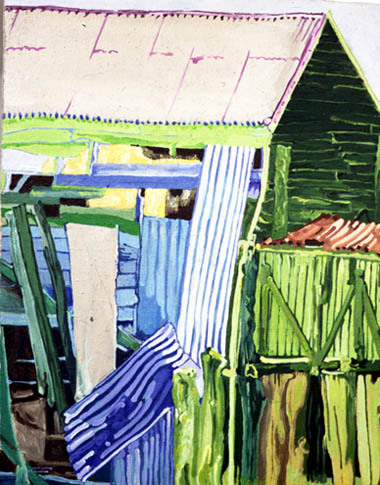 The foreground subject attracts the eye by the greater amount of colour in the hull: orange, white, yellow and green. This is further reinforced by the light cadmium yellow of the sails which is continued on in to the orange of the masts. The foreground boat is based on a second drawing done at Djibouti of a solitary felucca and similarly dated. The painting was completed and exhibited on board the Galileo Galilei prior to its arrival in New Zealand along with a work of the same format completed on the voyage and a group of Italian canvases. View from the deck of a typical packet-boat, the M.V. Taras Shevchenko, that journeyed between Europe and Australia until recent times. This was one of the last Soviet Union ship to do the Europe to Australia run. Moss painted the acrylic on canvas on board ship during the journey from Southampton, England to Melbourne, Australia. A number of preliminary drawings were done on board including works in pen and ink. Another drawing that survives and was used in the composition is a pencil drawing Matthew completed while crossing the Indian Ocean at about the same period to Singapore in the MV Kata Singapura. It contains a number of elements used in the final canvas including life-boat details. Even in those days, the seas off Indonesia were pirate-infested. As the vessel passed through the Coral sea Matthew Moss created the work of art under the curious gaze of heavily armed soviet sailors who were moving constantly about the decks and watching for any unusual movement from other ships in the proximity. The teak timber deckchairs that take up the right foreground are typical of the period when travelling long distances by ship was an option to airlines. Deck furniture was basic without the comforts and the over indulgence of cruise ships which supplanted their disappearance as the various petrol crises of the last quarter of the twentieth century reduced the economic importance of this type of packet boat. The predominant colours of the canvas are cobalt blue and a variation of viridian green, used to represent the deck furniture and the metal structure of the deck including the flood lamps and dividing walls and rails, not forgetting the flat blue area indicating the sky. 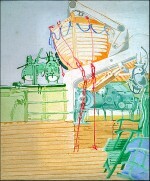 There is a transition to cadmium and ochre yellow in the timber deck and the outline of the life boat. To add plasticity to the objects depicted and a shot of warmth to the overall composition Matthew adds a touch of cadmium red to the steel chains bolted in to the deck in the centre, holding the life boat in place.